When Rob and I lived in NYC we decided to add a cat to our tiny apartment. Well, the tiny cat we choose from the ASPCA had a sister and they couldn't be parted. Of course not. So we brought them both home and they are with us still, only now in Oregon. 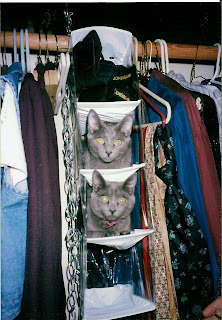 Everyday we would find them in a different nook and cranny of the apartment. Here is the first photo in the series of what I like to call "Maddy & Phoebe Get Cozy". Go find more ATWT photos at Jen's Cheaper Than Therapy.